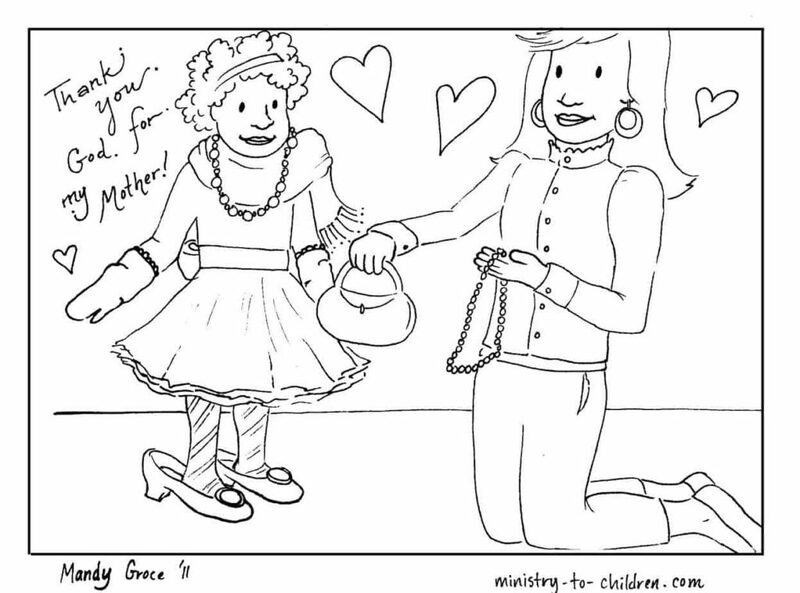 Mothers are a gift from God – our printable coloring sheets will help children remember that truth. Each page has a religious theme or prayer of thanksgiving for mom. We’ve also included the 5th commandment illustration with the “honor your father and mother” Bible verse. Watch Ariana explain these coloring pages – too cute. This illustration shows a happy school-aged boy looking up to his mother. They are surrounded in a heart frame with smaller hearts around them. 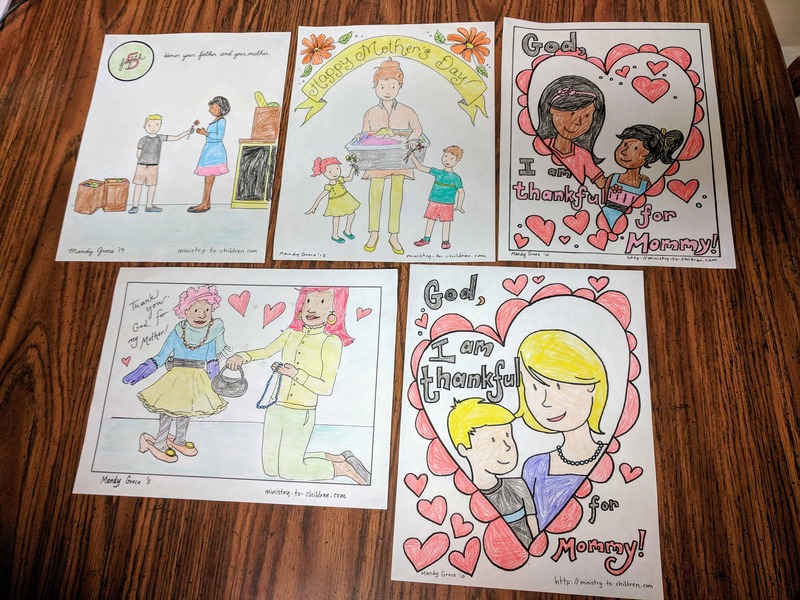 The text is a pray that reads, “God, I am thankful for Mommy.” The drawing is less detailed then some of our options, so it could be a good choice for preschool or kindergarten children. This is a similar illustration but features a young girl looking to her mom with affection. They are happy and smiling. The prayer text reads, “God, thank you for Mommy.” They are surrounded by a large heart with smaller hearts floating in the white space. Toddlers may struggle with this option, but the lines are thick and parents will still get the message. Readers often ask us to create more diversity in our illustrations. This was one attempt to show a more African American ethnicity in the our coloring sheets. This cute image shows a daughter playing dress-up in her mom’s clothing and over-sized shoes. The woman is knelling down handing the girl a purse. The prayer caption reads, “Thank you God for my mother!” This page might be hard for some children because of the details in the line drawing. We recommend colored pencils instead of crayons for most children. 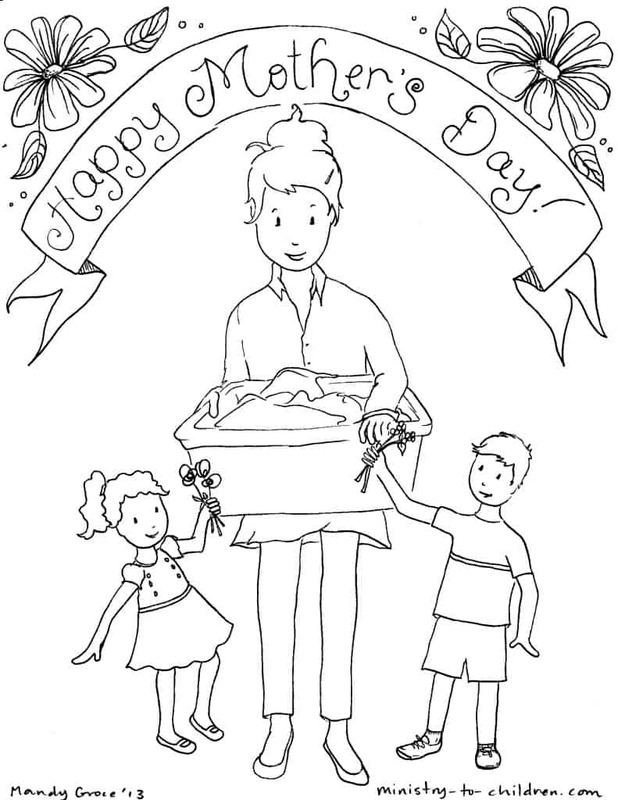 This next coloring sheet is has a simple caption that states “Happy Mother’s Day” surrounded by flowers. 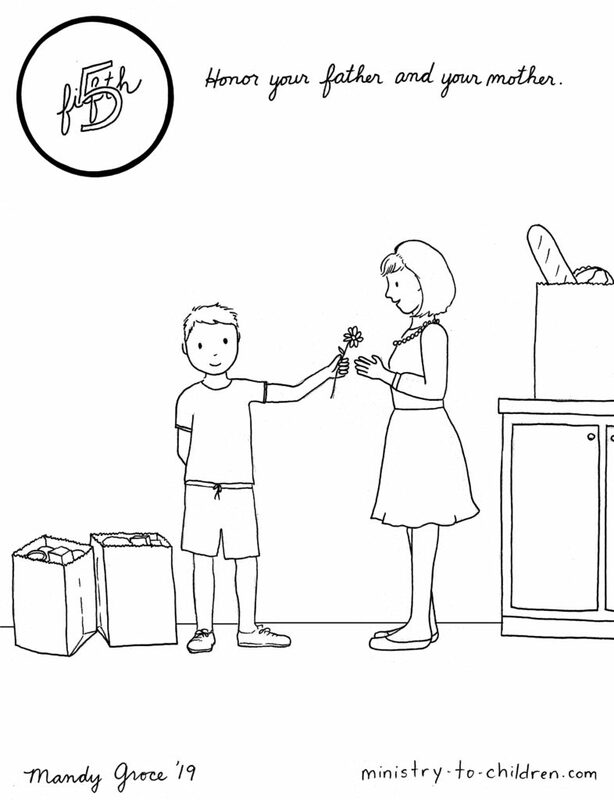 There is a boy and girl handing flowers to their mom while she holds a basket of laundry. This one does not have explicit Christian themes and could be used in secular public schools. Teachers have our permission to white-out our website address if that would create a problem. This drawing is from our new 10 Commandment Coloring book. It as the Bible verse from Exodus 20:12 which states, “Honor your father and your mother.” This one could be a great addition to our Sunday School lesson for mother’s day based on this same theme. The picture shows a boy handing his mother flowers, while having just helped her carry in sacks of groceries. This page has less details and would work well for younger children in kindergarten or preschool. We know that in several countries (United Kingdom, Australia, South Africa) it’s more common to say “mummy” so we created an alternate version of these colouring sheets. Here are those links for the boy version and the girl version. Do Christians Celebrate Mother’s Day? Absolutely – in the United States this holiday (always the 2nd Sunday in May) is recognized in nearly every congregation. In fact, the whole idea was pioneered by women of the Methodists church. You can read more background on Wikipedia’s mother’s day article or learn more from the History Channel. The commercialization of Mother’s Day has become a problem in the United States, like many other special days. That is one reason a simpe handmade craft or coloring page may be the best gift a mom can recieve from her children. Samples of how children might decorate these coloring pages for mom. Do you like these free printables? Please consider telling a friend about our website or even sharing our content through social media sites. You can leave a comment below to encourage our team who worked to make this coloring book available. Tony Kummer (Editor) reviewed & updated this page on : April 14, 2019 at 9:21 am. All our content is peer reviewed by our readers, simply leave a comment on any post suggest an update.